Romantic holiday paradise with free WiFi for 2-4 people. Villa Rosemary - is everything you would expect in a high standard accommodation. Incl. 2 bathrooms with fitted showers, 2 bedrooms (1 x double bedroom and 1 x twin bedded room). Air conditioning throughout, roll down insect mesh screens & patio doors. Fully equipped modern kitchen, large open plan lounge with TV, CD / Radio and free WiFi. BBQ & large patio area, sun loungers/ parasols, table & chairs. Superb views over valley, enchanting lake, romantic location approx 15 min to Corfu town, 15 min Gouvia Marina, 5 min drive west coast resorts, Glyfada, Pelekas & Corfu golf club - countryside walking/cycling idyll !! We provide villa pre-cleaning before occupancy, sufficient linens/towels/beach towels & pool maintenance. This house has a full EOT license. Please note: Our change over day is SATURDAY!! Car Hire: Car hire is recommended and available at the airport. - WC, shower and wash basin in each wash-room and electric shaving points fitted. - 'Lashings of hot water but please take care - very hot water with young children in particular, as the shower jet provides extremely hot water and should be adjusted to suit your needs' . There are 3 items of AC. one in every bedroom and one in the sittingroom. In front of the Villa. CD player and radio provided. Books for all ages in various languages. Our huge private sun patio is fully equipped with sunbeds and umbrellas overlooking a lovely valley. The Villa has its own absolutely private 6 m x 4 m pool. - No pets and non smoking means a cleaner environment within the villa and is an insurance compliance on the part of guests. Please be respectful of this request. - The open fireplace is for decoration only !!! - The property can be regarded as being semi-secluded and offers a more relaxing location for those who prefer to be away from the crowds but not too far away from the amenities if required. Only the sound in season of thousands of frogs and bird-life intrude in a most delightful way the lake provides a tranquil backdrop for that evening BBQ. - Please remember to extinguish burning embers/ashes afterwards for health & safety reasons! - 32inch satellite television with GREEK, ENGLISH and GERMAN channels available. 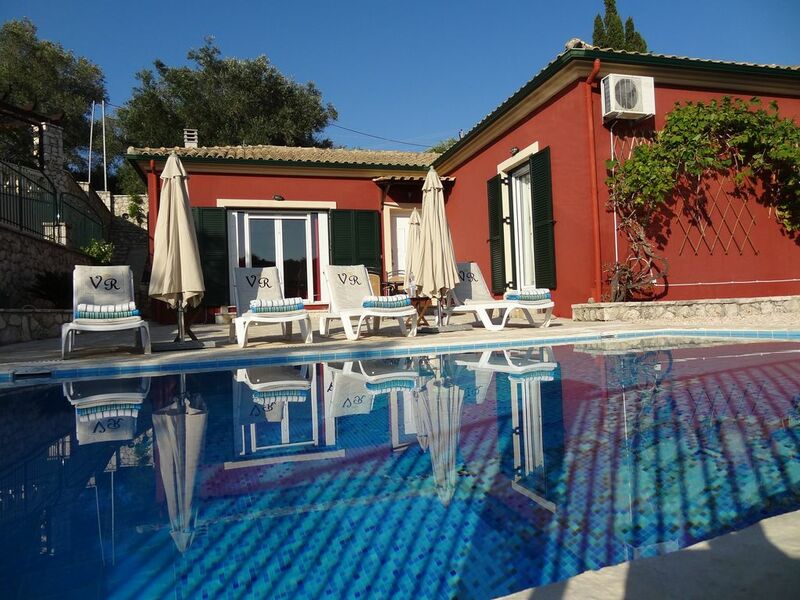 Villa Rosemary is located in a wonderful, peaceful, tranquil setting, yet being in the centre of Corfu is ideally located to explore both the North of the Island and the South. Nearby you have amazing beaches, watersports, fabulous restaurants and Go -Karts for your teens. 1 km up the road is Aqualand. Beaches such as Pelekas and Ipsos have inflatable bouncy castles which is vital (in our opinion) if your taking teens. The villa itself has everything you could possibly wish for, it is literally home from home. We would highly recommend a stay at Villa Rosemary because of it's location, also the fantastic, friendly communication with the owners and value for money. Sometimes when we`ve booked a villa the actual villa has not matched the description, this was not the case with Villa Rosemary where everything was as good, if not better, than the listing. The villa was easy to find and sufficiently private to relax completely. The much used pool was a godsend on the hot days, and the villa itself was cool indoors. the villa was very clean and well maintained and lacked for nothing in facilities. We spent most evenings at Pelekas ( about a five minute drive ) where there is a good selection of restaurants, our personal favourite being Levant at Kaisers Throne. Most of the Island is within an hours drive so the villa is very conveniently placed for visiting other parts of Corfu and still get back for a refreshing swim before heading out for an evening meal. i would certainly recommend Villa Rosemary and the only downside for us was having to leave!!! We are a family of 5 and our stay at Villa Rosemary was absolutely lovely!! The villa is VERY well equipped - we had everything we needed and it was spotless - I cannot fault it at all!! It is in a lovely, quiet position with a great view of the lake. The pool is cleaned regularly and there were plenty of outdoor chairs/loungers to use. The Villa Keepers, Debbie and Andreas were very helpful when it came to us hiring a car and they made us feel like nothing was too much trouble for them. Debbie gave us some recommendations on places to go, places to eat, other activities eg. horseriding - she was very accommodating and helpful. Thank you to Astrid, the villa owner for all of her communication and organising of everything before our stay. I would have no hesitation in recommending Villa Rosemary to anyone who wanted a central base to visit the beautiful island of Corfu. Wir fanden in der Villa Rosemary ein herrliches Refugium und haben uns glänzend erholt. Gerade weil wir nur zu zweit waren, konnten wir die Ruhe, die Annehmlichkeiten und den Luxus in vollen Zügen genießen. Das Haus entspricht genau der Beschreibung, der Pool war sauber und gut gepflegt, die Umgebung wunderschön und bis auf hin und wieder störende Geräusche vom nahen Aqualand auch sehr ruhig. Stephen, der Hausverwalter war sehr freundlich, gründlich und dennoch unaufdringlich. Eine echte Bereicherung. In der nächsten Umgebung können wir neben all den Attraktionen Korfus das "Ambelonas"-Restaurant empfehlen. Es liegt nur ca. 800 Meter vom Haus entfernt an der Strasse Korfu-Pelekas in Richtung Korfu. Alternative und doch sehr originäre Korfu-Küche in zauberhafter Lage. Alles in allem kann ich "Rosemary" nur empfehlen, und wir werden bestimmt auch noch einmal wiederkommen! Wir haben gute zwei Wochen in der Villa Rosemary verbracht (2 Erwachsene, 2 Kinder 4 und 9 Jahre alt). Unsere Erwartungen an das Haus und das Grundstück wurden mehr als erfüllt. Angefangen vom freundlichen Empfang durch den Villakeeper Stephen bis zur Ausstattung des Hauses hat uns alles sehr gut gefallen. Unsere Kinder haben sich so wohl gefühlt, das sie mich darum gebeten haben, das Haus zu kaufen und umzuziehen ;-) Der Blick von der Terrasse auf die grüne Landschaft und das Konnzert der Frösche am Abend erzeugt ein sehr entspanntes Gefühl. Der Pool ist klein aber fein. Wir haben im Haus nichts vermisst und würden bestimmt gerne wieder kommen. Die Lage des Hauses zur Erkundung der Insel ist optimal. Die Hauptstadt Kerkyra ist schnell zu erreichen (10 Minuten mit dem Auto) und zu den ersten schönen Stränden braucht man auch nicht länger. Wer Ruhe und Erholung sucht, ist hier genau richtig. Im Haus war alles sehr gepflegt und sauber, alles vorhanden. Im Ort findet man vom Bäcker, über Supermarkt, bis zur einfachen Taverne alles was man braucht. Für größere Einkäufe empfiehlt sich der LIDL in der Nähe vom Flughafen. Alles zusammen, können wir das Haus voller Freude weiter empfehlen !!!!!!!!! A lovely peaceful setting and a well-equipped villa, finished to a high standard. Beautiful views out and very quiet, but only 15-20 minutes drive from Corfu town, meaning you're close to lots of restaurants and shops. We'd recommend getting a car - even though you can get the bus up here from the town, the lane to the villa is very dark at night - and having a car meant we could get to local shops easily. The welcome pack of food was a nice touch, as was the friendly welcome on arrival. We'd definitely stay here again. Villa Rosemary rurally located a few hundred metres from the local village of Agios Ioannis ( Bakery, Supermarket, Chemist and a few Tavernas ) approx 11 kms north west of Corfu Town ( Museums, Art Galleries, Shopping, Banks and a selection of restaurants to suit all tastes. Beaches of West and East Coast are within 5 - 15 minutes drive away. Aqualand Water Park Sports and Leisure Centre is just 2 km away on the far side of Ag. Ioannis a must for families. Paleokastritsa with its monastery and boating facilities is a short drive north-west along the Ropa valley road. If you do not require a car, regular buses run from the village centre all year round. Ropa Valley Golf Club is only a 5-10 minute drive away. Pony Trekking and Cycle Hire close by in Ag Ioannis and Afra. The Kaiser's Throne Pelekas views across island nearby or just relax beside your own private pool. Other Activities: Go karting 3 miles away in town. 1. PLEASE NOTE!! CHECK-IN and CHECK-OUT is ALWAYS on a SATURDAY, unless special arrangements have been made with the owner !!!! 2. Air conditioning: Air conditioning is optional and will be charged locally. If it is required please ask for special rates. 3. Cleaning Fee: There is a cleaning fee of Euros 50 (for the aftercleaning of the Villa). It will be charged once on top of your rental amount. PLEASE NOTE: Extra guests other than those stated in the booking contract are not permitted unless prior arrangements have been made with the owner.